Stockholm, 4 June: In the lead up to World Environment Day, Blueair, a world leader in air purification solutions, calls for a global agreement to stop the flow of plastic waste into the air, similar to the UN resolution to stop plastic waste entering into the oceans. More than 300 million tons of plastic are produced each year. Half of that plastic becomes trash in less than a year. Out of the plastics produced, only 9% is recycled; the remaining 91% enters the air, land and water as waste. 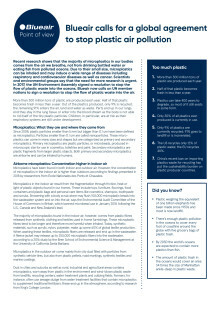 At the United Nations Environment Assembly in Kenya in December 2017, environment ministers agreed that the world needs to completely stop plastic waste from entering the oceans.The UN resolution signed had no time table and is not legally binding but set the course for tougher policies and sent a clear signal to business. 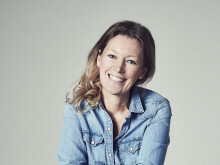 “The full health effects of breathing tiny plastic particles are not yet entirely understood but research proves that the threat to human health is high, said Sara Alsén, Global Sustainable Business Director at Blueair. 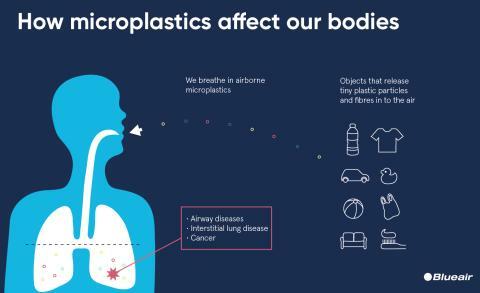 “More research is needed to better understand the impact of airborne plastics on human health and the United Nations Environment can take a lead. By working towards a global agreement to stop the flow of plastic waste into the air, similar to the UN resolution signed in December 2017 to stop the flow of plastic waste into the oceans, we would come a long way” continues Alsén. 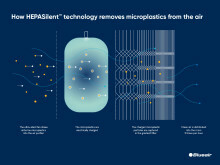 Plastic particles sized between 5 mm and 0.1 um are defined as microplastics. Microplastics are airborne and can be inhaled and harmful to humans. Microplastics found in lung tissue indicate that the body is not able to rid itself of all particles – i.e. that the microplastics are bio-persistent.